i had a few of my favorite people over for a sunday brunch. breakfast food is some of my favorite foods to make because they are so simple, but i don't often have time to cook any real breakfast during the week (i live on frozen waffles and veggie sausage at work). start by dicing up 3 apples (i like ambrosia, honey crisp, or gala...but any variety you like is fine!) and adding them to a small saucepan with 1 tablespoon of butter, 2 tablespoons sugar, and 1/2 teaspoon or so of cinnamon. cook on medium for about 5-10 minutes, stirring occasionally until softened. set aside. heat waffle iron. combine flour, baking powder, sugar, salt and spices. set aside. combine milk, egg, butter, apple and vanilla. add dry ingredients. stir until well moistened, but still lumpy. pour about 1/2 cup onto greased, hot waffle iron. bake until brown and crisp. 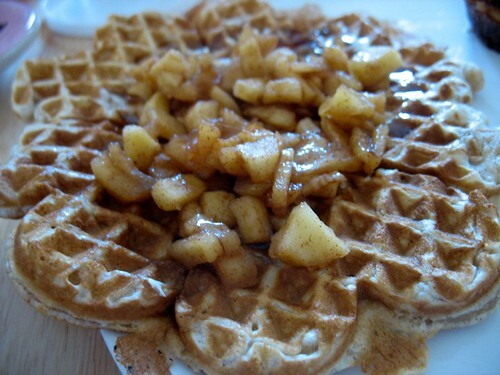 serve with syrup and apple mixture as topping. preheat oven to 350ºf. saute your veggies together just a bit until they soften, then set aside. in a large bowl, whisk together eggs, milk, salt, pepper, herbs of your choice, grated cheddar, and flour. grease a muffin tin with butter...like really, grease it really well or they will be a mess to get out. 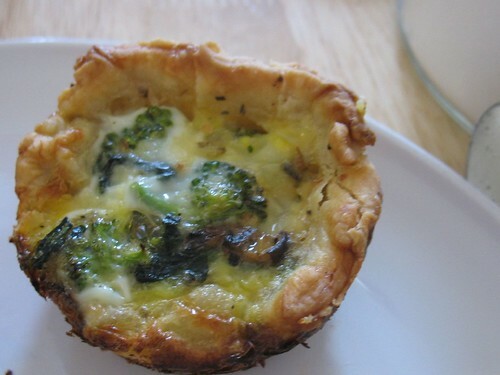 add a small layer of sauteed vegetables to the bottom of each cup and then drizzle egg mixture over each muffin cup, fill almost to the edge. bake for about 20-30 minutes. this will make about 5-6 mini quiche. mix dry ingredients. put oil in measuring cup and add milk. do not stir. add to dry ingredients.mix lightly to moisten ingredients and knead one or two times to form ball. roll out to about 1/2" thick. cut into 2" biscuits. bake on an ungreased pan at 475F for 10-12 minutes, until lightly browned. note: these were pretty dry, i wouldn't make this for a stand alone biscuit, but they were just fine as an quick and easy mate to gravy! lightly sauté the sliced mushrooms and onions in the 1 1/2 tablespoons oil. in another pan, combine and bubble the flour and 2 tablespoons oil over low heat for one minute. whisk in the stock or soy milk, along with the soy sauce and black pepper. cook until thickened, whisk out any lumps. stir in the mushrooms and onions. you can serve it up just like that, but i like to get the emulsion blender out and blend the mushrooms down a bit for a better flavor and consistency. Yum! Those little quiches especially. What a good hostess you are.